Best Pizza in Montana: Our 10 Favorites! Is there anything quite as exciting as a perfectly baked pizza emerging from a crackling wood oven with sizzling cheese? The fresh-baked aroma of pizza is one of life’s greatest pleasures, bookended by the whirling dough spun from skilled knuckles and smiling faces. 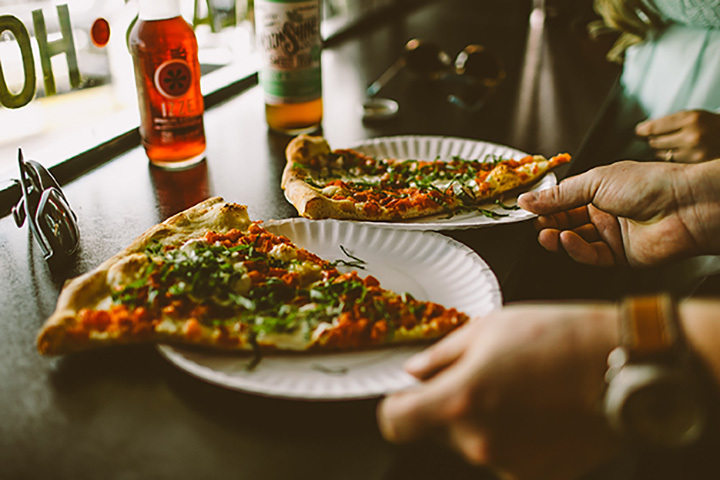 Here are 10 of the best places to get pizza in Montana! The brick oven heart of this restaurant is its cornerstone. The Missoulan and larger Montanan bounty provides all the fresh and flavorful ingredients with which Biga sculpts its handmade pies. Both due to the trendy university culture, and the climatic contrasts of the Bitterroot area, the toppings transition with the seasons. This flux means constant innovation and quality produce. Two favorites: The sweet and salty prosciutto & fig and the simple and exceptionally cheesy quattro formaggio. Bozeman is arguably the hippest town in Montana. There’re students, artists, craftsman, outdoorsman and families, all carving out recreation and work amongst serene mountainscape. Blackbird is modern and cool, with a streamlined focus on simple osteria/bistro fare. Most importantly, the crust is charred and crisp, the toppings are purposefully-combined and the sauce is clean and savory. Throw a dart at the pizza menu, and any pie will be authentic and delicious. The sauce is house-made. And the crust is really, really crispy. It’d be hard to have a bad pizza experience in this context. Eugene’s is always a best-in-state contender, and the accolades are deserved. It’s immediately apparent upon the loud crunch of crust, that tang of real pizza sauce, expertly applied in the right proportions, accented by the simplest, freshest ingredients. Simplicity is honored here, and it couldn’t taste better. This pizza staple could rest on its laurels, coasting on support from a well-deserved following garnered over 60 years. But Howard’s continues to fire some delicious, thin crust and Sicilian-style pies. Both dough and sauce are made by hand, daily, seven days a week. And it’s this pride and dedication to the humblest of ingredients that manifest into delicious, well-executed pizzas. The signature pizza with everything is a must have. In the perpetual battle for pizza dominance in Montana, Nalivka’s is often near the top of the heap. And for good reason: It’s all about pizza. Come for pizza, and pay in cash. No credit cards. The crust is homemade, and is delightfully flaky, worth savoring even after the toppings are long gone. Any taste, refined or otherwise, will be satisfied, thanks to the eclectic combinations: Sauerkraut & sausage, chicken breast with béchamel, and chicken, bacon & ranch. This consistently-good pizza restaurant has locations throughout Montana, and has become a popular spot for all via an approachable menu and atmosphere: Not too hip, not too square. As with any modern, self-respecting establishment, Mackenzie emphasizes local and sustainable, both in terms of its sourcing of produce, but also its participation in local nonprofits. And in addition to some solid, American-style pizza, there’s a decent selection of flatbreads, salads and other accouterment. Moose’s has evolved a lot from a simple family-run post-work watering hole in the 1950s. A popular social site, the establishment eventually grew to include food, namely it’s “World Famous Pizza.” Whether internationally-renowned or not, Moose’s is a welcome oasis for, yes, pizza, in a landscape otherwise stereotyped as evocative of pork ’n beans over open fire. The crust and sauce are tangy and savory, so any topping is only a bonus. When the weather’s nice, there’s often a line near Red Lodge’s best pizza restaurant. The best part is its no-frills and unpretentious approach. The toppings are high quality and varied, but it’s the classics that’re welcome here. There’s no marinated tofu or fancy emulsions here: the crust is chewy in the center, the sauce is herbal and fresh, and staff are friendly. Wisdom is a tiny, high-plains mountain town, barely a block of buildings, with more one-ton hay bales than humans. And it essentially shuts down in the Winter. But when the snow melts, and motorcycles and RVs and pickups beginning speeding by, Antler’s Saloon serves-up some solid Montana pie. There’s decent pizza hidden in this expanse of farmland and national grazing pasture. It’s heavy on the toppings, and exceptionally light on anything of pretense. The simple chalkboard menu is all one needs to know about Me Too: It’s casually gerrymandered into simple categories: “Pizza,” “beer,” etc. The pies are well-executed, and the staff is friendly, but make no mistake: The focus is all on making pizza. And it’s made well. Slices come in borderline-Jurassic portions, with a thin crust and quality toppings that often put this restaurant in the top ranks.